EMS was founded in 2010 by Gordon Scown who is highly regarded as the most trusted advisor to property managers on all matters relating to electricity measurement and tariffing in SA. In 2015 EMS merged with SA Energy Services, through acquisition by WINconnect, forming the largest inset network manager in the state. EMS is the go-to organization within the WINconnect group to provide the most affordable commercial and retail billing operation. WINconnect is, by all metrics, Australia’s leading provider of embedded electricity network management services. We now view modern high-rise buildings as micro-grids in their own right, with challenges of local generation and multiple utilities. Our solution is to ensure that these buildings benefit from the design of smart micro-grids. Across the backbone of fibre, hydraulics, HVAC and power, WINconnect not only delivers utility billing but integrates with intelligent building management systems. WINconnect holds retail energy authorizations, is registered with AEMO and holds an Australian Financial Securities License. Private electricity networks (known as inset or embedded networks) capitalize on the bulk supply of power into a single point. Owners of buildings are able to on-sell the power to tenants subject to several criteria. One of these is to provide accurate billing. This is what we do. Full service billing including reconciliations and collections. Multi utility installations (electricity, hot-water, solar) particularly in greenfield residential such as View on King William. Validation of the monthly meter read data provided by Client’s Meter Reader (or EMS can provide this as an optional service) and estimation of substitute data where required. A billing data validation report detailing any significant variations in individual tenant consumption or demand. EMS will maintain and update all appropriate tariffs including the appropriate network tariff, TLF and/or DLF. · WINenergy holds a Retailer Authorisation with the Australian Energy (AER) and the Essential Services Commission of Victoria (ESCV). · WINenergy holds an Australian Financial Securities License. On-selling of electricity to tenants within a shopping centre has long been considered as industry best practice. The asset owner has a significant investment in electricity infrastructure and a properly configured private electricity network (called an inset or embedded network) enables the owner to secure a return on that investment. The recurrent surplus from on-selling adds to the revenue stream of the shopping centre, ultimately contributing to its asset valuation. A well managed embedded network should deliver $1500-$2000 per annum per shop surplus to the shopping centre administration. EMS deal with 40 shopping centres in SA, whilst our parent WINconnect service an additional 50 in Vic, NSW, Qld and WA. The WINconnect group offers the most affordable billing operation in the market using the experience of our EMS division in Adelaide. The EMS tariff engine works in conjunction with centre management to determine tenant energy costs that can be billed with the monthly centre management rent package. WINconnect Embedded Network Optimisation Audits (WENOA) can tell you where you are loosing electricity and profit. We offer this service on a performance basis. If we can find you some improvement by operating a site the WINconnect way, then we don’t get paid at all. In Adelaide, these audits are delivered by our metering experts SA Energy Services. Some owners like the separation of rent and electricity – others like it bundled. In our full service suite (WIN Gold) we can send out WINconnect electricity invoices and manage the accounts receivable process. This creates a single point of responsibility for performance management with no scope for finger pointing. Commercial buildings already issue monthly rent invoices to tenants. The EMS tariff engine can supply a feed into the commercial invoicing system so that the dollar value for electricity consumption is included. The building manager tracks tenancy changes and accounts receivable. 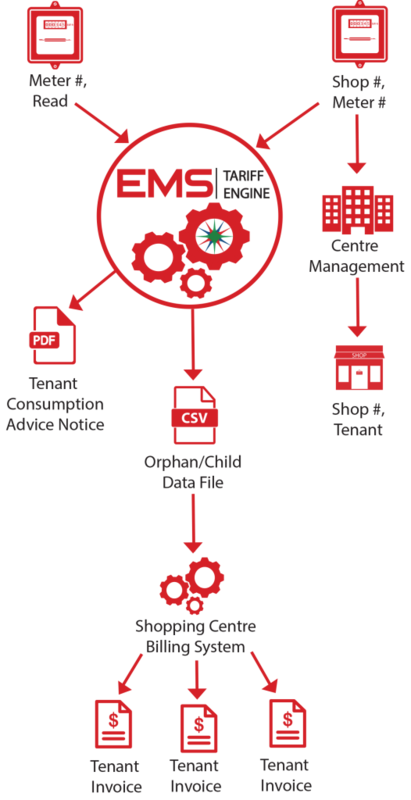 EMS is able to issue a consumption advice notice that has the hallmarks of an electricity bills so that meter reads and tariff details are delivered to the end-user tenant. EMS currently bills 300 commercial and retail properties and is regarded as the “go-to” source for information in the South Australian inset or embedded network market. With an expansion of our data centre capacity, and with the standardisation under NECF, we now offer our services to the National Energy Market using the breadth and depth of our parent, WINconnect.